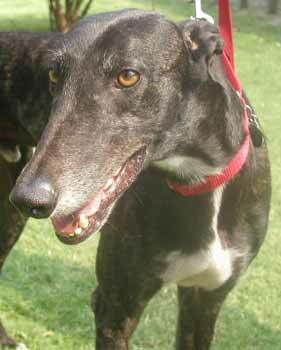 Carbo, aka Hungarian Boogie, is a strikingly handsome dark brindle 5½-year-old male born October 1, 1996. 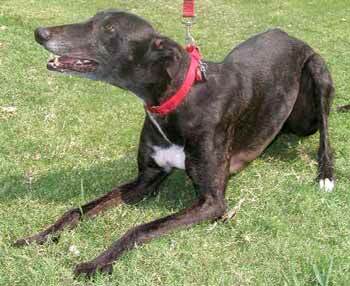 Carbo's history is not clear - he raced for about 4 months in late 2000 and was found as a stray in 2001. 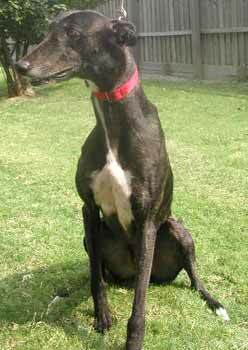 Carbo will do best in a home where he is the only dog or possibly one greyhound companion and there must be no small animals. He has a lot to give with his loving, friendly personality. Those golden eyes are a beautiful contrast to his dark brindle coat. "Beautiful!" is the best word I can think of to describe CARBO. This dark, sleek, loving boy will steal your heart. It is unfortunate that we cannot keep him. I pray he'll be adopted by someone who will appreciate his "love me" eyes, his snuggle and his way of letting you know what he would like. He grins and flips his head when he needs something, as if to say, "Hey, you, come over here, I need a toy tossed for me!" He'll be easy to train to do a variety of tricks with the right person who has the time to work with him. He loves to eat and is very food motivated, but at the same time, he doesn't steal food. He bonds very quickly to whoever feeds and fusses over him. He will literally put his own collar on if you hold it out for him. We haven't had any problems with his trying to get onto any of the furniture unless he has been invited.